Is Mexico City much different from Los Angeles? Well, L.A. is almost at sea level and Mexico City is a mile high metropolis. They speak Spanish in both towns and they are both overpopulated. Any other differences? Yes, Mexico City doesn’t have Andres Vega anymore and Los Angeles does. 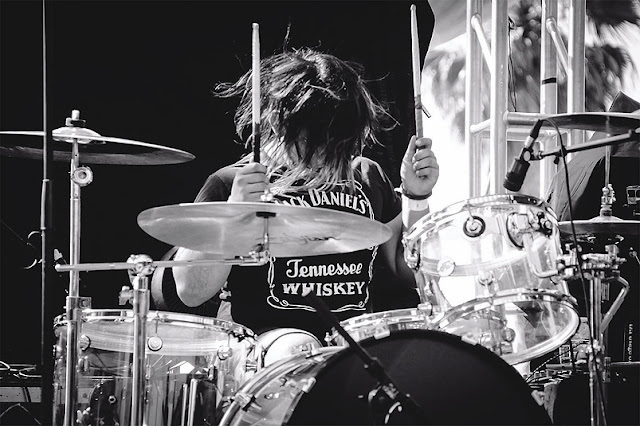 Andres Vega, of course, is that terrific Alternative/Metal drummer everyone and his mother has been talking about for the last few years. He has it and everyone wants it – or at least everyone wants to listen to it. “It” refers to the beat and Andres’ beat is infused with all sorts of wondrous techniques and styles and sources. One of those sources, a very important one that we all would like to know about is Tino Contreras. He was the premiere drummer in Mexico for decades and Andres actually had the opportunity to study under him. Andres also received a degree in drum performance from the highly celebrated and quite famous music conservatory in Hollywood, The Musicians Institute. This guy has been around the block. He’s had some of the best teachers in the world and some of the greatest band experiences also. He had the opportunity to play at the world famous National jazz Festival at the Nezahuacoyotl Concert Hall in Mexico City. (Say Nezahuacoyotl three times really fast). Nezahuacoyotl, by the way, is Nahuatl, the Aztec language, for “Coyote who Fasts.” It was also the name of a great Aztec warrior, philosopher, poet and ruler in pre-Columbian Mexico. We wonder if he wasn’t a great drummer also, like Andres. Andres also played other international festivals and toured quite a bit when he was living in Mexico, so he is no stranger to the rigors of the life of a working musician in Los Angeles, where he now lives. He is so used to working in fact, that he is a member of two bands in the L.A. area: Haster, the award winning band from Orange County (a half hour south of Hollywood) and Bonesteel, which is based right in Hollywood. He is a co-founder of Bonesteel and has recorded both studio and live tracks with them. Andres and Haster will be touring through the Southern United States this year and they are all looking forward to it.